There is a shared professional responsibility for improvement across all of our academies. The role of each headteacher is to ensure that their academy is actively reviewing and evaluating their effectiveness and striving for excellence. The key driver for school improvement in Waterton Academy Trust (WAT) is the sharp and timely self-evaluation of the leadership team of the academy. The school improvement function of WAT is to develop and hone those self-evaluation skills and to provide appropriate and developmental challenge to the leadership team. 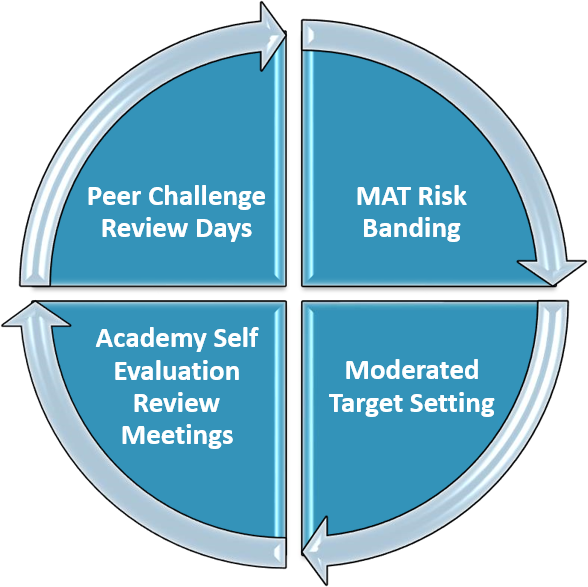 The core of the accountability process is the regular Academy Self-Evaluation Review (ASER) meetings. These take place at regular intervals throughout the year following an agreed agenda. The number of meetings a year is weighted according to the need of the academy. Those academies that are sponsored, which have moved into an Ofsted window or who have been identified for another reason as requiring closer support are identified will have at least 6 meetings during the year. Other academies will receive at least four meetings per year. The first ASER meeting begins with Risk Banding task in September and includes the agreement of the Key Performance Indicator Targets for the year. Regular accountability monitoring of the academy by WAT officers and the Academy Standards Committee (ASC) will use these KPI’s as both the internal indicator and the external comparative measure. This information feeds into the Headteacher Performance Management meeting. Headteachers work within a Framework for monitoring and evaluating the quality of Teaching and Learning within their school. This framework provides a common structure for recording of leadership judgements and a common framework for judging the performance of T&L based on the Teacher Professional Standards. This allows the SSIO’s within the Trust to share outcomes consistently. The CEO meets all head teachers each month to review the summary of the leadership judgements in order to provide further challenge and support to schools. These monthly CEO meetings focus on the presentation of the current teaching profiles, data position, pupils at risk of not attaining and impact of actions to date. There is a significant focus on disadvantaged pupils. Headteachers provide a monthly summary report for this meeting. There is cross-school moderation and challenge of each Academy Self Evaluation Summary Statement (Peer Challenge Review) which includes peer Headteachers and the Central SI team. Following a review, schools produce an action plan to improve aspects identified within the review. There are five points each year when summative attainment reports are shared with the ASC and Trust Board School Improvement Committee. Any drop from KPI’s at these points will be investigated during the ASER meeting. If there are issues, which either the academy and/or SSIO feel that they do not have the capacity to improve on their own, then this will trigger support from the existing good practice and capacity across the MAT. If there is no resolution following that level of support then the SSIO will develop a formal action plan to improve the position of the academy. If the intensive support plan does not bring about a satisfactory change then the Trust board will signal a 'change in status' of the academy and consider it to be managed as a Sponsored Academy and will consider whether structural changes in leadership are required. The SSIO and CEO meet weekly, and any concerns about a staffing issue or drop in standards can be reported informally quickly and weekly feedback on actions can be communicated. The SI Trustee and SSIO meet on a monthly basis. The SI committee meet three times a year and reports are presented to the full board 3 times a year. The SSIO will provide regular leadership support to Academy Leadership Team when requested or the need identified, providing additional capacity to their improvement work, developing the monitoring of impact and recording in the self-evaluation. This work will identify actions for the ALT to work on; some sessions are with middle leaders developing their accountability monitoring and evaluations and some sessions will be joint monitoring activities. Schools identified as Stabilise Stage have additional school improvement support and systems. There will be an extended ASER meeting at the midpoint in the year to review overall progress in the academy with the SI team. We work in close partnership with other multi academy trusts, school improvement advisors, Teaching School Alliances and system leaders to both provide and receive additional support capacity when required. We are currently involved in delivering a SSIF project as part of a Wakefield strategy. The academy works in close partnership with Optimum Data Services. Together we have developed our data tracking systems to match the assessment ethos of Waterton Academy Trust. The suite of reports is available to be used at an Academy SLT, MAT SLT, Local ASC and MAT Directors level. The reports are published to WES (Web Portal) each half term and are available to all governors and directors. Review of Governance has resulted in a new model which retains the importance of local accountability with a clearer emphasis on strategic governance at the Trust Board level. Trust wide CPD employing a growing bank of Waterton knowledge and high quality external partners has further strengthened our ability to identify need and act accordingly. Moderation of assessment and standards between staff has led to greater accountability for outcomes across our schools. Two Trust academies were inspected by Ofsted during the 17-18 academic year. Both inspections were very successful. Normanton Common was judged as Good and identified as likely to be judged outstanding. Normanton Junior was judged to be Good with Outstanding features, a massive step forward from the special measures judgement it received before joining the Trust. One further inspection has taken place during the first term of 2018-19, with Crofton Infant securing a Good outcome, from an internal baseline positon of inadequate in September 2017. In 2017-18 there were no Waterton schools who returned outcomes that were below floor standard. This is an improved position from 2016-17. The significant focus on leadership and teaching & Learning in South Kirkby resulted in rapid change and improved outcomes.